Following the tour of Golf Adriatic, the Accidental Locavore and company went on to explore the Kempinski Hotel Adriatic. Entering the recently built hotel, the lobby is a big open expanse with an inlaid floor and many chandeliers. Downstairs is a large and luxurious spa, with a host of top-notch services. After touring a standard room and junior suite (both lovely, with lots of high-end finishes and the latest in electronics), we went up to the top floor to the white Presidential Suite (the other one, at the opposite end of the hotel is the Black Suite). It’s massive and very white, with columns draped in Swarovski crystals, white couches, white marble everywhere–you get the idea. The floor-to-ceiling glass opens up to an almost equally gigantic terrace. Had it been clearer out, we would have been able to see across the Adriatic to Venice, but we happily settled for the coast of Slovenia. When we turned around and went back inside, we found a large table set for dinner. It turned out to be the surprise we’d been hearing rumors about all afternoon. Marko, our guide from the Istrian Tourist Bureau, had worked for the hotel and managed to get Istrian Master Chef Zoran Čobanov of the hotel to prepare one final feast for us. Chef took many of the local products we’d been eating all week and elevated them to the stratosphere! 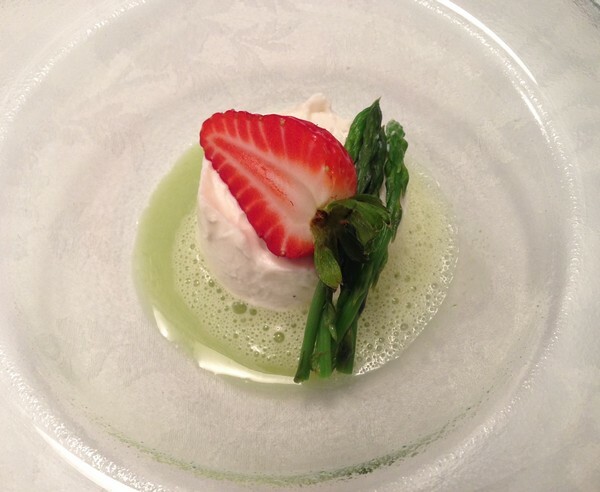 It started with an amuse of fresh ricotta with three spears of wild asparagus and half a strawberry. The ricotta was creamy and delicious and the slight bitterness of the asparagus was tempered by the sweetness of the cream and strawberry. From there we moved on to the “real” menu. First up was one of the most beautiful presentations of tuna carpaccio I’ve ever seen! Three bars of tuna were centered in a large white bowl surrounded by three drops of beet sauce on the left and three drops of carrot purée on the right. 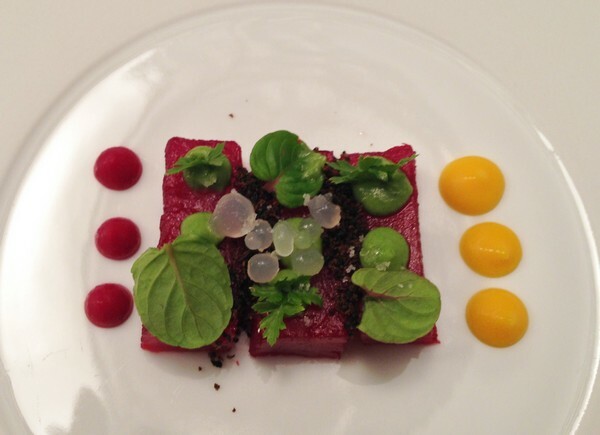 Topping the tuna were some micro greens, dehydrated olives and drops of lime jelly. I was hesitant at first; as you all know, beets are not on my hit parade, but I just ignored the drops on the left and focused on what turned out to be a dish that you just never wanted to finish! 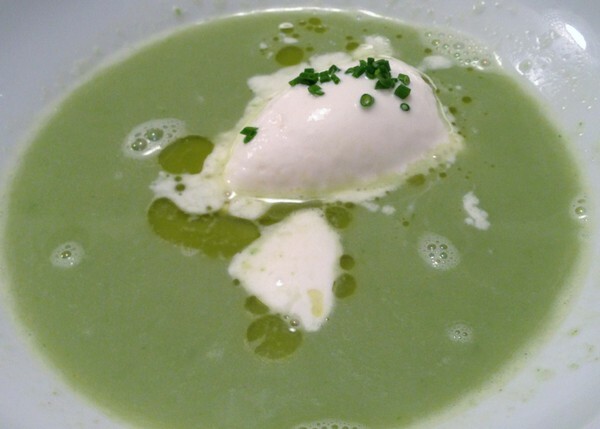 Following that was a light and refreshing asparagus soup. Making it unique was the Grana Padano ice cream, slowly melting into the soup. It was like the best combination of cheese and cream, but better, way better! That was followed by what was described as an “Istrian new fritaja with black truffle”. I guess that the easy way of describing it would be to call it a deconstructed version of scrambled eggs with black truffle, but that is really an injustice. 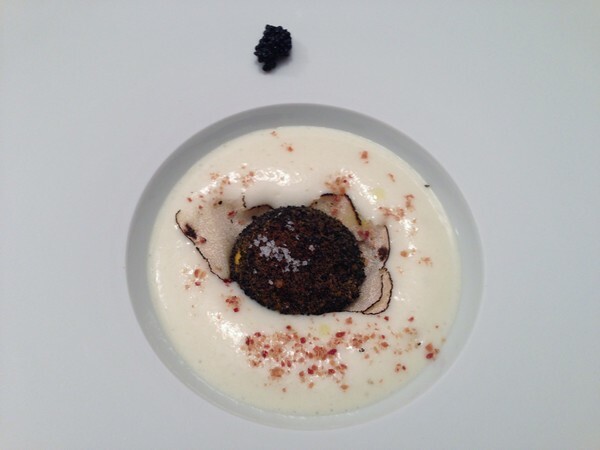 You were presented with another large white plate with a small dark knob in the center of a creamy, pale yellow sauce, surrounded by truffle shavings. There was a sprinkling of local sea salt and off to the side, some caviar. The knob was actually a mushroom hiding the yolk of an egg. When you cut into the mushroom the yolk was broken and then you spooned the caviar in and mixed it all up. In a trip filled with amazing meals, this is the dish I’ll be dreaming about! When we got through swooning over the fritaja, there was a fish course with a piece of Adriatic fish, toasted and served on a “sepia ink sponge” with tiny clams. 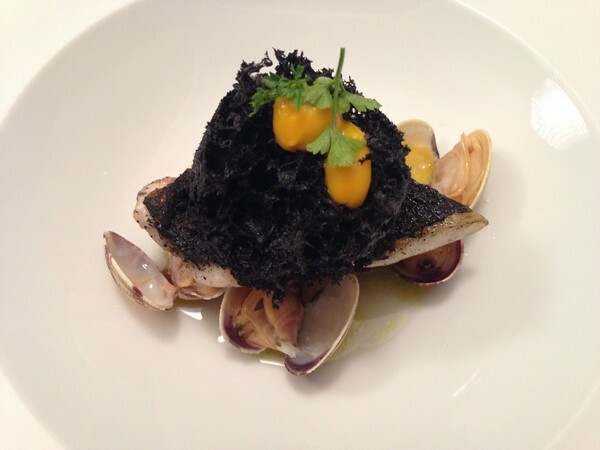 Although it doesn’t sound as divine as the rest of the menu and for some the idea of eating a black sponge seemed daunting, the sponge turned out to be an airy piece of bread dyed black with squid ink and topping a perfectly cooked fish filet and sweet clams. Adding a drizzle of the local olive oil made this seemingly simple dish as wonderful as the previous courses. 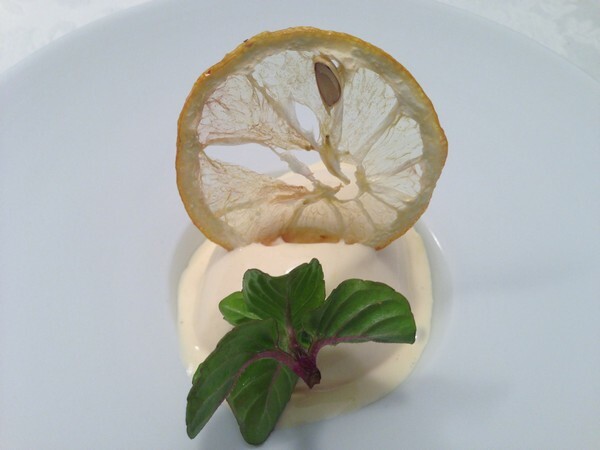 To cleanse our palates, the fish was followed by a smooth and refreshing frozen lemon cream. Palates cleansed, we moved on to dessert. What was simply described as “Chocolate cake with olive oil” was anything but! Riding on a trail of cream sauce was a chocolate ball, dusted with cocoa. There was a single raspberry, a drop of blueberry sauce, a greenish disc of olive oil and a swirl of the thinnest chocolate cookie. 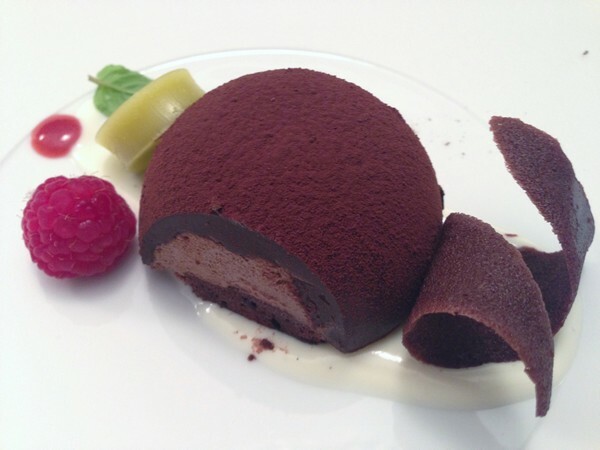 The ball consisted of a chocolate cookie topped with mousse and surrounded by a hard chocolate shell. Taking a taste of each of the elements with the centerpiece, just gave new dimensions to this grand finale. While this truly memorable evening was created just for us, I’ve been told that some of the dishes (including my favorite–the fritaja) are available in the hotel restaurant Kanova. Or, for an extraordinary evening, you can book the suite, have them recreate our amazing dinner and take your after-dinner drinks in the suite’s rooftop hot tub overlooking the lights of the Adriatic coast. Živjeli!